The organization told us, "During summer 2012, Hope Through Grace made an investment into the long-term health and wellbeing of the community with the purchase of a colorectal cancer educational exhibit that we call The Adventure Colon. It is a 20 ft. long inflatable replica of a human colon that provides an excellent visual of how cancer and other diseases develop in the colon. Through this exhibit, individuals better understand how colon cancer is identified, how it advances and how to lower their risk for the disease." So far, thousands of people have been through the exhibit brining about a direct, positive result from the use of Hope Through Grace's inflatable colon. However, the impact is more far reaching that that. Hope Through Grace has also received numerous invitations to bring their inflatable to other communities, extending the educational scope of this balloon. And, of course, there's the added bonus of exceptional media exposure when you use inflatables. "Hope Through Grace has enjoyed increased local press coverage with the addition of The Adventure Colon to our health fair exhibit spaces. 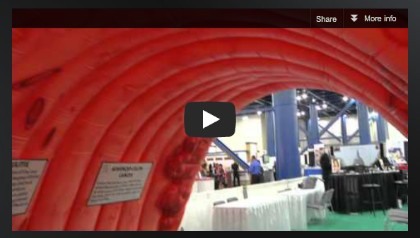 One local television station highlighted The Adventure Colon as an example of worthy exhibits to visit during a four-day national convention that was held in Houston this past summer." Hope Through Grace wants to use their inflatable to ultimately lower the cases of colon cancer by spreading the news that the majority of colon cancer cases are preventable through colonoscopy screenings. We're proud to have had a hand in making their dream a reality.